Lower back pain or lumbar pain costs millions of lost work days each year. Pro Ice's cold therapy lumbar wrap can alleviate the pain from an acute injury or help prevent chronic injuries from repetitive stress. These injuries can occur on the job, during hobbies or sports. Pro Ice cold therapy delivers a consistent temperature, creating the ultimate cold therapy. Standard cold packs fail to provide compression like Pro Ice. Compression not only helps deliver the ice where it's needed, but also keeps the wrap securely in place. Pro Ice's cold therapy does not drip, so no more wet t-shirts, and it allows for mobility when icing. For those whose backs are taxed during a day's work, Pro Ice provides the ultimate in convenience; even ice on the drive home without creating a mess. Without the ice insert, the lumbar wrap can be used as a stand-alone support belt. The medium-sized model (PI 700) is intended for individuals with a waist size of 26-33 inches. Two other sizes are available the PI 720 for individuals with waists from 34-46 inches and the PI 740 for individuals with waists from 47- 58 inches. The lower lumbar back wrap (PI 700) already provides back pain relief for an hour, but for some with a serious back problem, that may not be enough. 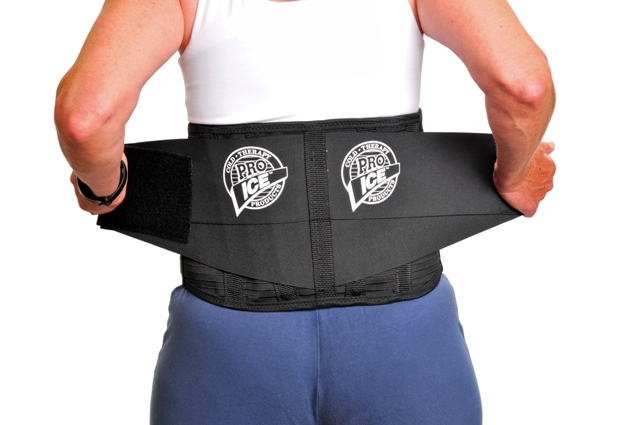 When back pain just wont go away, extend the relief with an additional ice insert (PI 701). Lower back pain or lumbar pain can have a negative effect on daily life. Pro Ices cold therapy provides non-toxic pain relief from muscle strain or injury. Pro Ice outperforms any cold pack on the market. Try Pro Ice cold therapy for back pain relief.